The CRF250 RALLY's 250cc liquid-cooled single-cylinder DOHC engine's performance is focused on bottom-end torque and high rpm power, plus a linear delivery. Peak power of 18.2kW is delivered @ 8,500rpm with peak torque of 22.6Nm arriving @ 6,750rpm. The PGM-FI feeds the fuel/air mixture through a 38mm throttle body and draws air from the air box via a direct connecting tube. The exhaust muffler has a diameter of 115mm, houses the catalyser and uses two chambers. A large-bore down pipe helps the engine breathe and make more power. The CRF250 RALLY's frame is constructed from steel, with twin oval-section main spars and a semi-double cradle. 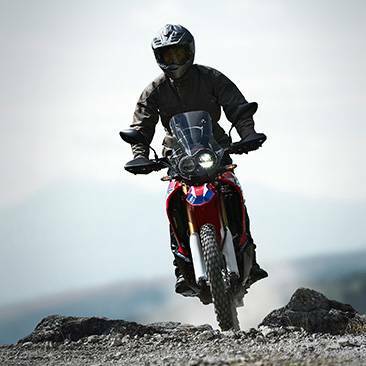 A wheelbase of 1,455mm is matched to a 28.1° rake with 114mm trail and ground clearance of 270mm (15mm more than the CRF250L). Wet weight is 157kg.